Our 100% wool Tilt Saucer Hat " " Oozes glamour and elegance reminisces of the 1940’s and 50’s. Felt ribbon and feather detail gives it a truly vintage look. 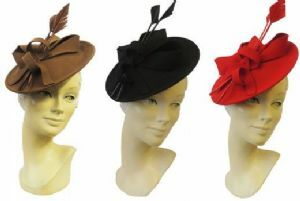 We are delighted to offer this stunning Hatina in 3 classic colours in one standard size. This item will be delivered to you boxed.